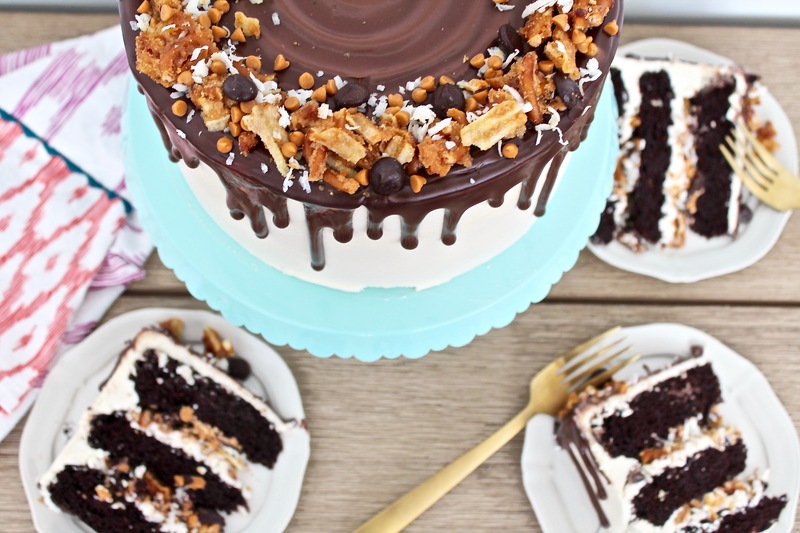 Everything but the Kitchen Sink Cake: Dark chocolate cake layers filled with just about everything but the kitchen sink, including potato chips, pretzels, butterscotch chips, chocolate chips and coconut. This cake! You guys, I think you’re going to go nuts over this one. 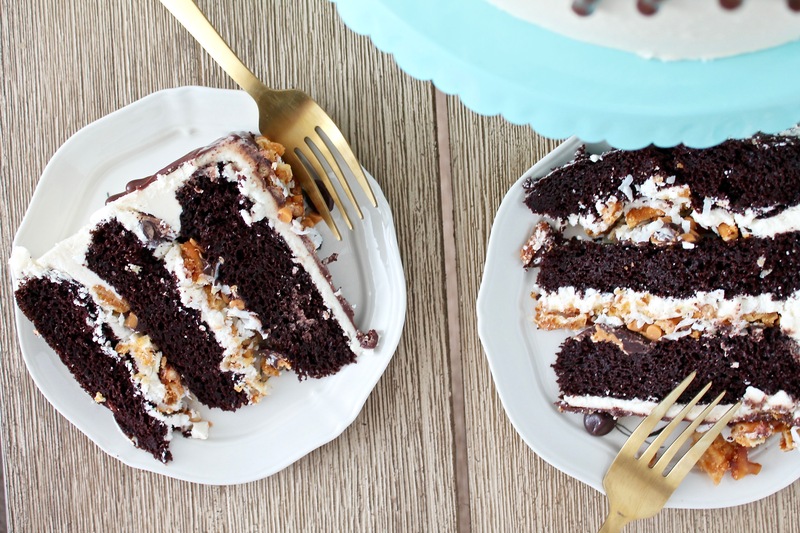 With potato chips and pretzels baked into a toffee-like bark for the filling, combined with chocolate chips, butterscotch chips, toasted coconut, brown sugar frosting and chocolate cake layers – it’s got a little something for everyone. An Everything but the Kitchen Sink Cake wasn’t on my list of cakes to make until about two weeks ago when my mom sent me a link to an Everything but the Kitchen Sink Cookie. She asked if I’d recreate the cookie, but I immediately knew I wanted to make it a cake first. I’d never had an Everything but the Kitchen Sink Cake, and actually couldn’t find one on Pinterest. Lots of bars and cookies, but no cake. That definitely meant I was making this cake STAT! The world was in need of an Everything but the Kitchen Sink Cake and I wasn’t going to let anyone wait another minute for it. I love the process of coming up with flavor and texture combinations. It’s fun to think about what flavors will pair well together and think of creative ways to include texture in the cake. 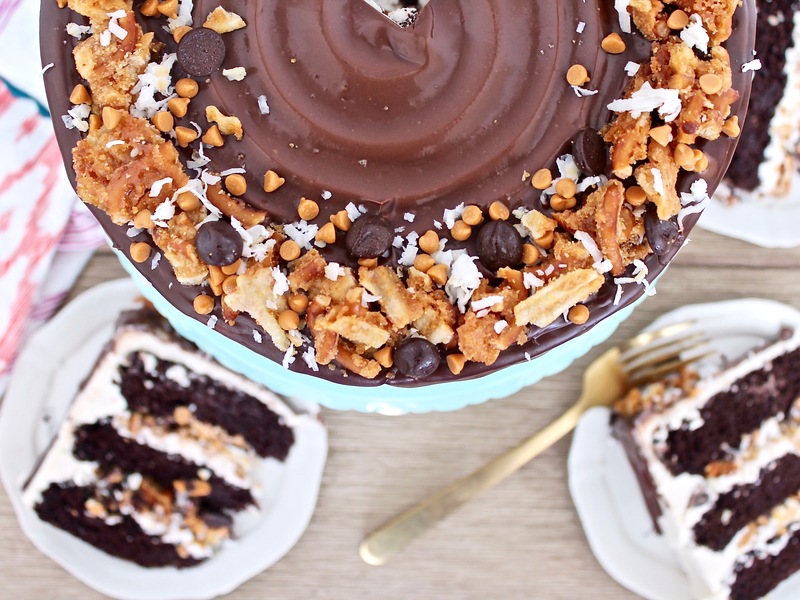 First and foremost, this cake needed potato chips and pretzels. Nearly every recipe for an Everything but the Kitchen Sink cookie or bar throws in these two salty snacks. 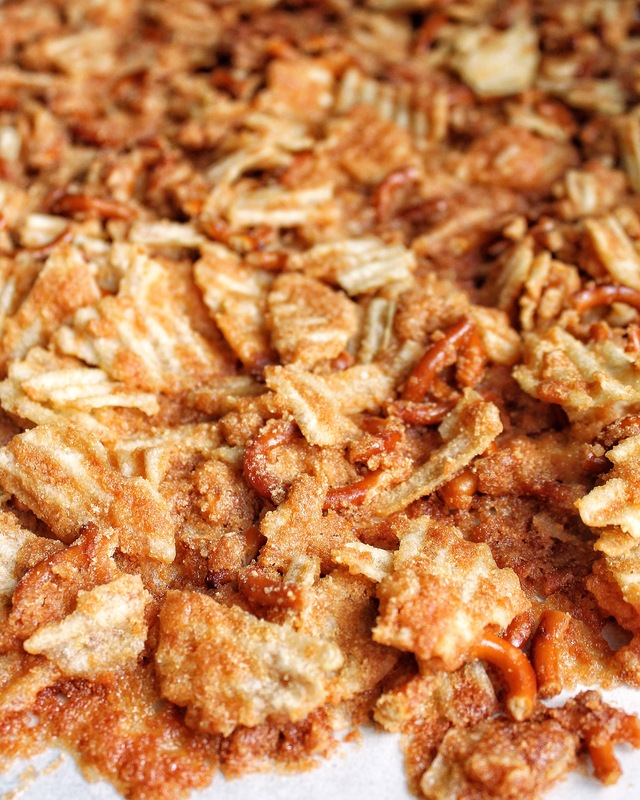 However, I knew I needed to come up with a way to bake them like the oat crumble I just did in my Peach Crisp Cake so the chips and pretzels would keep a crunch and not get soggy. Lucky for me, I knew exactly where to go for some inspiration. In her cookbook, Milk Bar, Christina Tosi has a Cereal Crunch recipe that uses brown sugar, butter and nonfat dry milk powder baked onto cornflakes to create a crunchy cereal treat. I expected I could use the same idea for the potato chips and pretzels. It worked perfectly! In fact, it came out even better than I anticipated. The chips and pretzels have a fabulous crunch to them and keep their salty flavor, while the brown sugar, butter and milk powder combination create a sweet toffee-like element. There’s really no better name for this filling than “crack.” I started snacking on it before adding it to my cake and could barely stop myself from eating the entire batch. With the main filling complete, I then just grabbed what was in my pantry and threw it in. 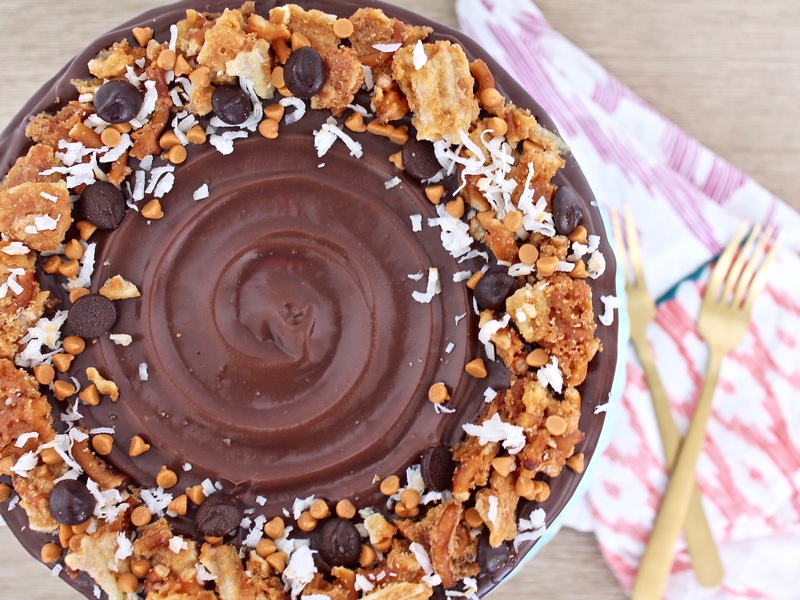 I used chocolate chips, butterscotch chips and toasted coconut. I also think pecans would be a good addition, but we don’t love nuts in our desserts so I left them out. For the cake layers, I went with my chocolate cake, but I also think this cake would be amazing with my yellow cake too. I think you could also play around with the frosting on the cake. I did my brown sugar frosting, but almost went with my caramel frosting and even thought about doing my peanut butter frosting for a sec. I’m excited for you to make this cake and play around with some flavor combinations of your own. I think you’ve got to try the crack filling, but then have fun with the “extras” and add in what you like. And, of course, let me know what you create! 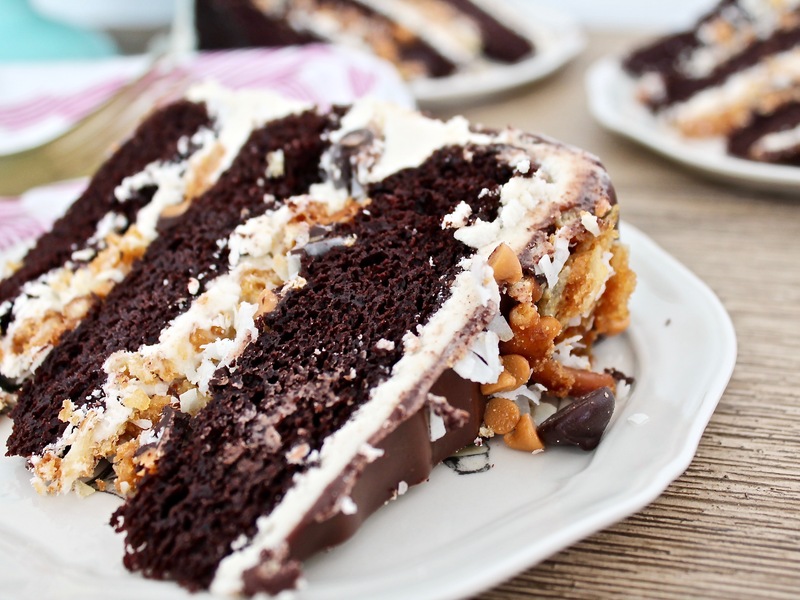 Chocolate cake layers filled with just about everything but the kitchen sink, including potato chips, pretzels, butterscotch chips, chocolate chips and coconut. Preheat your oven to 275 degrees F. Line a baking sheet with parchment paper. Set aside. Pour the pretzels and potato chips into a medium bowl. Add the sugars and milk powder and toss to mix. Add the butter and toss the mixture to coat. As you toss, the butter will act as glue, binding the dry ingredients to the chips and pretzels, creating small clusters. Spread the clusters on the parchment lined baking sheet. Bake for 25 minutes. They should look toasted and smell buttery. Cool completely before using in your cake. You may need to break up the mixture even more to layer in your cake. It will be hard to cut slices of the cake if the crack filling pieces are too big. I like to break up the mixture by putting it all in a large ziplock bag and use a rolling pin to roll or hit the mixture into smaller pieces. The crack filling can be made ahead of time and stored in an airtight container - 1 week at room temperature or up to 1 month in the fridge or freezer. Preheat the oven to 350 degrees F. Spray three 8-inch round cake pans with nonstick spray. (You can also use four 6-inch pans). Line the bottom of each pan with parchment paper, then spray the pans again. Combine the flour, sugar, cocoa, baking soda, baking powder, and salt into the bowl of an electric mixer fitted with a paddle attachment and mix on low speed until combined. In another bowl, combine the buttermilk, oil, eggs, water and vanilla. With the mixer on low speed, slowly add the wet ingredients to the dry, scraping the bottom of the bowl with a rubber spatula. Pour the batter into the prepared pans (about 15 to 16 ounces in each of the 8-inch pans or 11 to 12 ounces in each of the 6-inch pans) and bake for 18-20 minutes. Level each cake layer as needed and then wrap in plastic wrap and chill until ready to use. In a medium sauce pan, combine the brown sugar, corn syrup and water over medium heat. Stir to combine. Bring the mixture to a soft boil and let cook for about 5 minutes to thicken. Remove from heat and let cool for about 15 to 20 minutes. When the brown sugar syrup has cooled, put the butter in the bowl of a stand mixer fitted with the paddle attachment. Beat the butter for about 2 minutes, until light and fluffy. Once all the powdered sugar is incorporated, slowly stream the brown sugar syrup into the bowl. Once the syrup has been added, turn the mixer up to medium-high and beat for about 5 minutes. If the mixer gets too soft, refrigerate the frosting for 30 to 60 minutes. Beat the frosting again for a couple minutes. Place your first cake layer, right-side up, on a cake plate or cake board. Cover the cake layer with about 3/4 cup frosting and the sprinkle the potato chip pretzel crack filling. Place another cake layer on top and repeat with frosting and filling. Place your final cake layer, top side down, on top of the frosting and filling and cover the entire cake with a thin coat of frosting to lock in the crumbs. Freeze the crumb coat for 10 minutes. After the crumb coat is chilled, continue frosting the cake and decorate with a chocolate drip (1 cup dark chocolate chips and 1/2 cup cream) and extra filling. I’m totally making this for myself on my birthday!!!! 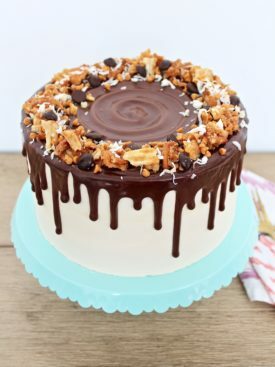 How do you make the chocolate drizzle and make the ridges on the top?? It’s one cup chocolate chips and one cup heavy cream. Hope you love it! Hey Courtney! Which brand of nonfat dry milk powder do you use? Thanks! I just use the store brand from my grocery store. I don’t have a huge preference on the milk powder, but I also haven’t tried a ton of different brands. 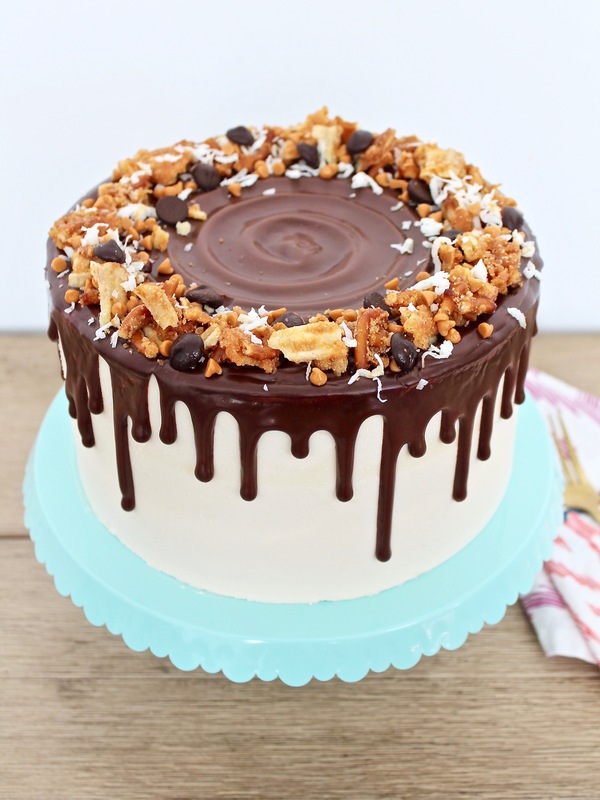 I want to make this for my daughter’s birthday, what is the chocolate drizzled frosting? The chocolate drizzle is just one cup of dark chocolate chips heated with 1 cup of heavy whipping cream. I’m curious about the photos and the directions you outline because the frosting with the brown sugar is not white and your final product appears to have a chocolate melt on top or something like it that is not described in your directions. Can you clarify, please? The brown sugar frosting does lighten quite a bit as you mix it for 5 minutes on medium-high. The drip is optional and I didn’t list it – but I probably should. Sorry! it’s just 1 cup dark chocolate chips and 1 cup heavy cream. Did you realize that you have 46 tablespoons of butter listed in the ingredient list? In the opening page on Pinterest (where it lists the 26 ingredients) it says 46 tablespoons of butter?!? That’s so strange. It’s certainly not 46 tablespoons of butter and it doesn’t say that on my page. Not sure why Pinterest is pulling it up that way. 46 tbsp of butter is correct. 14 tbsp to make filling and then 4 sticks (32 tbsp) in the frosting. How do I keep the hot water from from cooking the eggs while combining the wet ingredients to make the cake? Stir rapidly as you slowly add the water. Thank you for this recipe! I’m making it for Saturday, and I made the “crack” tonight. After making it, I panicked. I used “instant nonfat dry milk powder,” but I noticed your recipe doesn’t specify “instant milk powder.” Will this turn out ok? Thank you! How did it go? You should be fine with what you used.